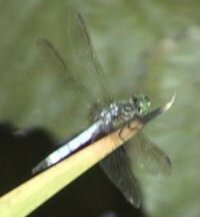 Here is a dragonfly sitting by my big pond on 7/18/00. It is probably a blue dasher or Pachydiplax longipennis . I would love to include drawings or photos of aquatic insects here. I do include a bunch of photos that I took. The problem is that I am not a good photographer (my camera will not focus closer than 5 feet! 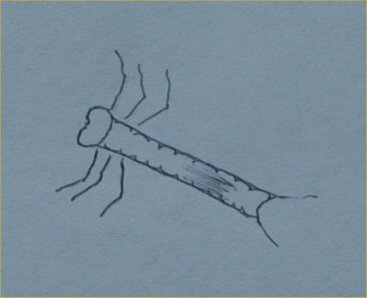 ), and all of the photos and drawings of insects in books and on the internet are copyrighted. But, you can visit the links to see some drawings of some of these insects and to get information on them. In most cases, I do not cover individual species but only higher levels of classification. I have identified preserved insects before, and even the entomologists have trouble identifying the exact species sometimes. For example, many Americans can identify a mosquito larvae but which of the 120+ North American species is it? Mealworms - raising them to feed to other animals including frogs by the pond! 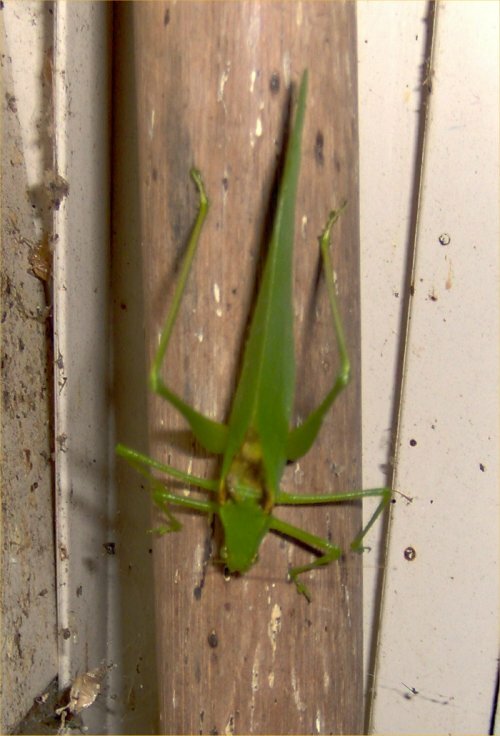 Here are some photos of a katydid on the wall of the house on 8/18/09. 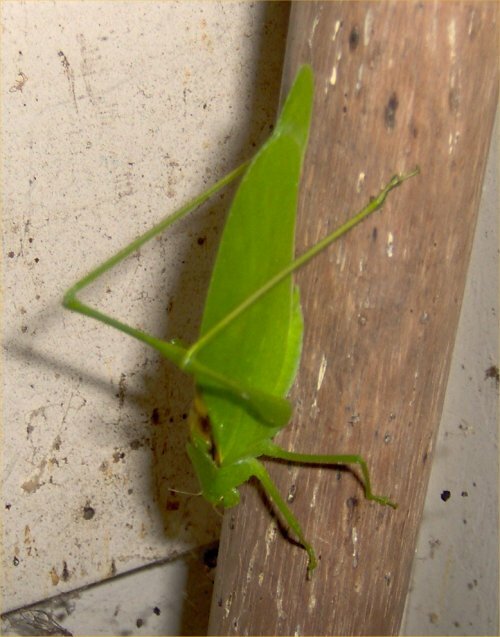 I do not have a section on katydids so I stuck the photos here! Spiders, ticks, and mites are not insects. They are arachnids and can be found on this page on my web site. On 7/27/07, Lynne sent this photo of the strangest eggs I have ever seen in a pond. They are strange because they form a ring. I am not sure what they are but we have guessed some sort of damselfly but I really do not know. The drawing of what hatched looks like a dragonfly or mayfly larvae or something like that but the bracelet-like eggs are really confusing me. What do you think? Here is the photo and details in her words. "I found some eggs in a neighbor's pond today (July 25) here in central Vermont. The clear 3/8" diameter strand is configured in a ring about the size of a hair elastic, with hundreds of tiny (salt grain size) green dots in a very orderly spiral pattern along the strand. The ring was attached to a submerged rock and is very elastic...."
"The diameter of the elastic band (which does not break up when handled and will stretch to fit over my hand) is about 1/4" - 3/8" when un-stretched. It is about the size of a hair elastic but thicker. It is hard to tell how big the actual egg white part is because they are arranged in a ring and not separate. And the coil of green dots is very uniform and regular. As you can see, I've scraped the strand off the rock and have it in a jar to see what hatches...."
On 8/9/07, she contacted me again. "I'm including here a drawing of what hatched. I tried to do some research on insect larvae to see what it is but to no could find almost no pictures of larvae that I could use for ID. 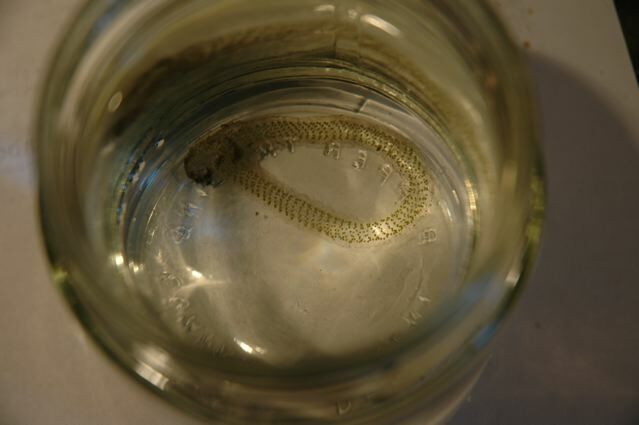 The larvae are only about 1/8" long and "swim" in the water by wiggling their bodies. I'm sorry for the inadequate drawing but they are very small and I don't have a good scope for viewing them at high power. Any new ideas of what they are?" 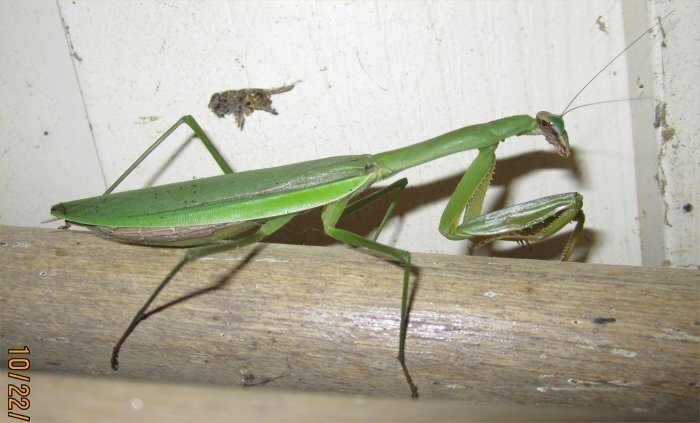 Praying mantis on my broom handle on 10/22/15, probably a female with eggs.